While I was helping my mom in Baltimore, I had a little reprieve every day. I took each opportunity to head down to the Inner Harbor, finding a bit of peace by the water even with the crowds. 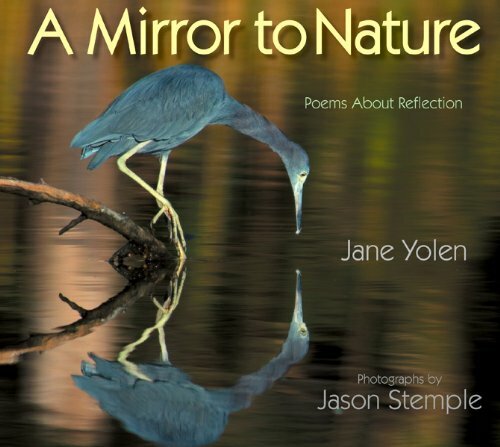 There's a magic to water that I find reflected in today's poetry book - reflected being a key word. As the roots, rocks, snow. Poetry Friday is hosted today at Dori Reads. Don't forget to apply to be a Cybils judge - especially in the Poetry category! We were just having a discussion at #kidlitchat the other day about whether kids are still into poetry. It's nice to see more of it being published just for them! Ilana, kids might not be into poetry on their own, but all it takes is one enthusiastic teacher/librarian and a classroom library/shelf full of enticing poetry books, and they are IN! Thanks for highlighting this gorgeous book of reflections, MR. I've seen many of Yolen's books, but not this one. Thank you for showing it off. The coyote poem is beautiful. The image of stillness makes quite a picture doesn't it? Thanks! Thanks for sharing this one. I hadn't see it either. And thanks for joining in on Poetry Friday. The cover alone is amazing. Sounds beautiful - thanks, MotherReader! How lovely! Can't wait to get my hands and eyes and ears on this one! My summer has been challenging too so I can totally relate you your desire to get right into fall. I am hoping for a easy slide for both of us!